A Loving Couple The process of choosing an ideal wedding dress is always a great challenge for brides-to-be. 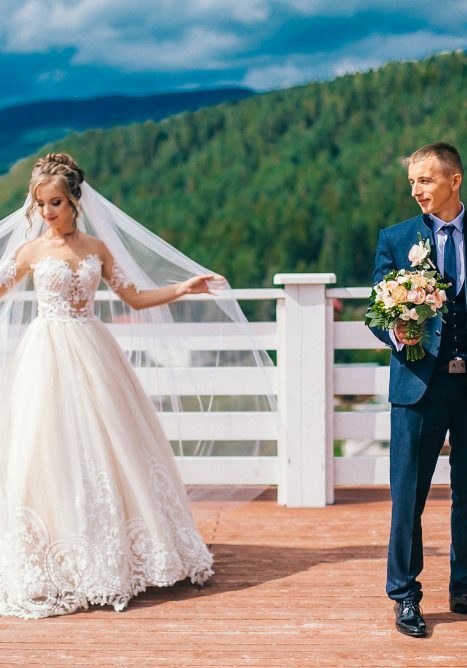 However, petite brides sometimes face even more problems. Limited options and the risk of looking too small often become reasons of an early disappointment. But here, we are to share all secrets and tips on how to make a right choice and look incredibly beautiful on a wedding day! Silhouette and proportions Your wedding dress should make an accent on your merits and the best parts. If the gown is in proportion with a tiny stature, it never draws too much attention to the height that is absolutely undesirable. The first rule: wedding dresses for petite brides must have a narrow silhouette. For instance, you can choose sheath dresses, which are considered to be the best ones for tiny figures. Ball gowns with pompous skirts can create the impression that you’re almost drowned in all that abundance of your dress. Moreover, narrow silhouettes hide imperfections of the bodуand add additional height.